I did my PhD at the Cancer Research UK Laboratories in London and spent 4 years as a post-doctoral fellow at The Scripps Research Institute in San Diego (USA). In 1994 I started my laboratory at the National Institute for Medical Research (NIMR, London) and moved to the University of Warwick to take up a Professorship in Cell Biology in 2006. I am currently funded by a programme grant from the MRC. 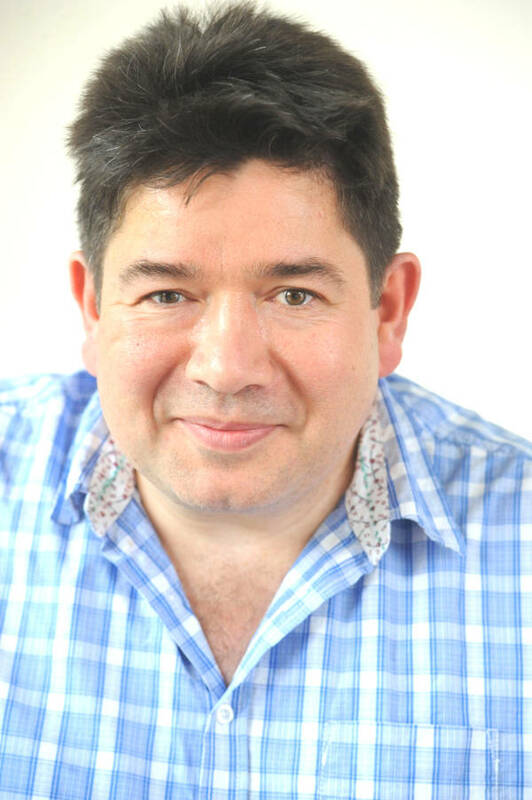 I am also Director of Warwick’s MRC Doctoral Training Partnership (DTP) and a member of University Senate. The faithful segregation of chromosomes during cell division is essential for life in all eukaryotes. Errors during chromosome segregation in humans can lead to miscarriages, birth defects and proliferative diseases, such as cancer. Chromosome segregation is monitored by a surveillance system, known as the spindle assembly checkpoint (SAC), which ensures that the physical separation of sister chromatid pairs does not take place until they all are correctly attached to opposite spindle poles (bi-oriented). Our research is aimed at understanding the mechanical and biochemical basis for SAC signaling and how this is disrupted in human disease. My laboratory has had a long-standing interest in the fundamental mechanisms that regulate the cell division cycle. Initially using the fission yeast, Schizosaccharomyces pombe, as a model organism we have made fundamental discoveries on how cells trigger entry into mitosis (Millar et al., 1991; Millar and Russell, 1992), how this transition is regulated by environmental stress (Millar et al., 1995, Lopez-Avilés et al., 2005) and how cells ensure chromosomes are only replicated once per cell cycle (Wuarin et al., 2002). We have also uncovered novel factors required for the retrieval and bi-orientation of sister chromatids (Sanchez-Perez et al., 2005, Franco et al., 2007) and identified an evolutionarily conserved mechanism that switches off the spindle assembly checkpoint (Vanoosthuyse et al., 2009; Meadows et al., 2011). More recently, we have uncovered how the Bub1, Bub3, BubR1/Mad3, Mad1 and Mad2 spindle assembly checkpoint proteins bind kinetochores and shown that this is conserved in human cells (Shepperd et al., 2012; Silio et al., 2015; Mora-Santos et al., 2016) and identified the RZZ complex, which is absent in yeast, as an independent receptor for the Mad1 and Mad2 proteins in human cells (Silio et al., 2015). The laboratory uses a combination of genome engineering, molecular genetics, biochemistry, phospho-proteomics and high speed multi-wavelength live cell imaging in both fission yeast and human tissue culture cells (see figure) to explore the mechanistic basis of spindle checkpoint signaling. The laboratory is primarily funded by a programme grant from the Medical Research Council (UK). Currie CE, Mora-Santos M, Smith CA, McAinsh AD and Millar JBA. 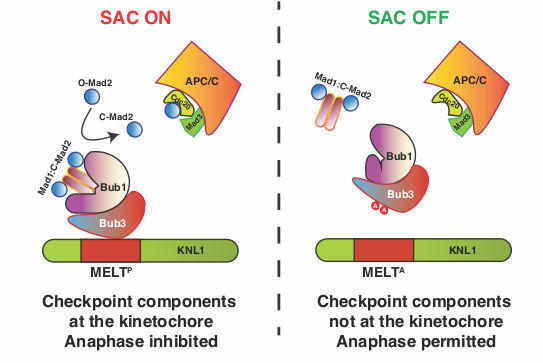 (2018) Bub1 is not essential for the checkpoint response to unattached kinetochores in diploid human cells. Current Biology 28, 929-930. Meadows JC, Messin LJ, Kamnev A, Lancaster TC, Balasubramanian MK, Cross RA and Millar JB. (2018) Opposing kinesin complexes queue at plus tips to ensure microtubule catastrophe at cell ends. EMBO Reports 2018 doi: 10.15252/embr.201846196. Meadows, J.C., Lancaster, T.C., Buttrick, G.J., Sochaj, A.M., Mora Santos, M., Messin, L., Mora Santos, M.d.M., Hardwick, K.G. and Millar, JB. (2017) Identification of a Sgo2-dependent but Mad2-independent pathway controlling anaphase onset in fission yeast.Cell Reports 18, 1422-1433. Silió, V., McAinsh, A.D, Millar, JB. (2015) KNL1-Bubs and RZZ Provide Two Separable Pathways for Checkpoint Activation at Human Kinetochores. Developmental Cell 35, 600-13.